(5-1) Whether any Identity Card is issued to Pensioners? Identity Card to Pensioners is issued by the respective Ministry/Department/Office. The format of Identity Card had been revised vide OM No 41/21/2000-P&PW(D) dated 2572013, 12.08.2015 and 20.08.2015. The Pensioners Identity Card contains the details regarding address, telephone number, date of birth, post held at the time of retirement, PPO/PRAN No, Aadhaar Card (if available) etc. (i) The Pensioner Identity Card should be in the prescribed format. (ii) The Identity Card should be of the standard size of 8 1/2 cm x 5 1/2 cm. (iii) The Pensioners Identity Card should be printed ( and not hand written) on good quality paper of 125 GSM or equivalent. (iv) The Identity Card would be got laminated by the Department/Office before handing it over to the pensioner. The Identity Card to pensioners retiring from the Central Government offices in Delhi and other Metropolitan cities/ big cities may be printed as Plastic Cards with the help of PVC Thermal Printer with 600 DPI resolutions. In case such facility for printing of Plastic Card is not available in the office from where the employee is retiring, the Pensioners Identity Card may be got printed locally from the market. 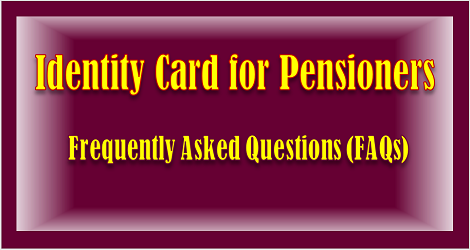 (5.2) Who will issue Pensioners Identity Card to Retired All India Services Officers? The pensioners’ Identity Card is issued by the Department in which the employee last worked. In the case of IAS officer retiring while on Central deputation, the Identity Card may be issued by concerned Ministry/ Department. In case of officer retiring from State Government, the Identity Card may be issued by the concerned State Government. (5.3) Whether Pensioners’ Identity Card can be issued to retired employees covered under NPS. The concerned Ministries / Departments may issue Pensioners’ Identity Card (PIC) to retired NPS employees in the format prescribed under OM No 41/21/2000-P&PW(D) dated 25.7.2013,12.08.2015 and 20.08.2015.